Though even the road from Podgorica to Budva, a mere 70 kilometers, was closed for a while due to the weather, we now had no problem, taking the short bus ride to the coast, still at times passing through corridors of snow nearly two meters high. 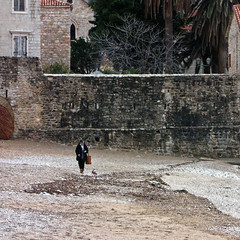 And even in Budva, after arriving at the town’s bus station, there was still a tiny bit of snow on the ground, here and there. The mountains separating the country’s interior from the coast are very rocky and only scenic at times, but exiting them, looking down on the coastal strip from about 1000 meters up, is rather spectacular. 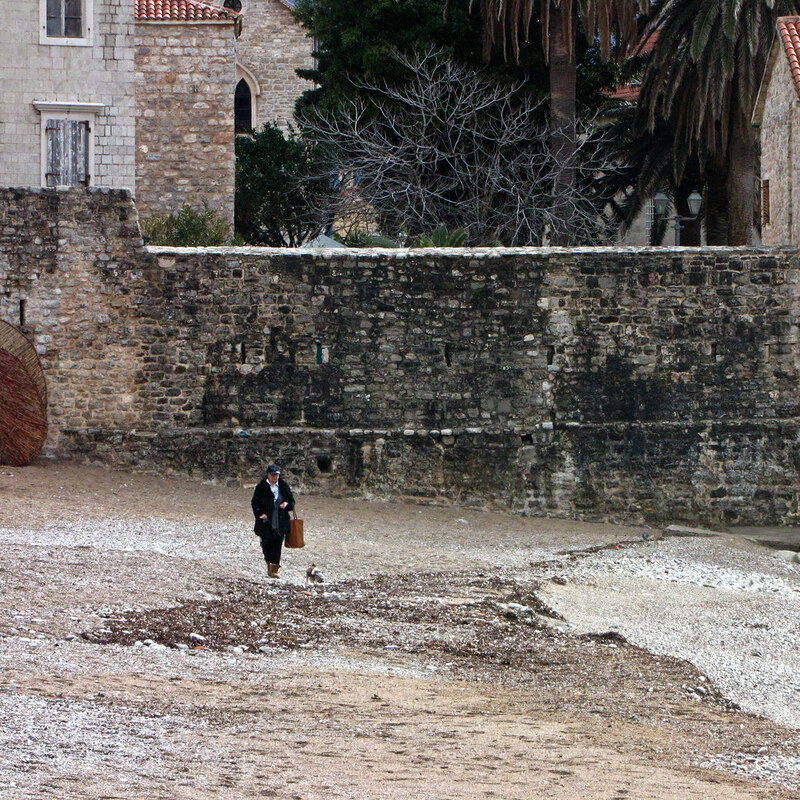 Budva, touted as a major tourist destination, and apparently loved by Russians, is a bit of a downer. 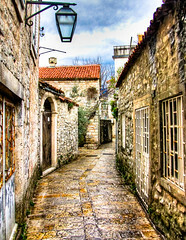 The old town is indeed something of a baby-sized version of Dubrovnik, but there are plenty of towns on the eastern Adriatic who aren’t too dissimilar. Sadly, though at least one hostel rents out reasonably priced, if tiny, self contained apartments, restaurants in the old town charge ridiculous prices. We ventured outside to get our fill. The town does have its history. In Greek mythology, Budva was founded by Cadmus, the son of a Phoenician king and brother of the legendary beauty Europa, who gave the continent it’s name. Europa was scored by Zeus, himself seducing her in the shape of a bull, taking her to Crete and making her the first queen of that island. Cadmus promised to bring his sister back, but it’s difficult fighting the will of Zeus. Instead, he founded the Greek city of Thebes, but not after slaying a fine monster of the deep. The gods being somewhat annoyed by having their favorite monster slain, Cadmus and his wife Harmonia had to pack up and leave, moving up the Adriatic coast, founding a new town and naming it after the oxen they were traveling with, Bouthoe, now Budva. Though it’s a myth that eastern Europe has taken over winning the Eurovision song contest, particularly the Balkan countries tend to do unreasonably well. 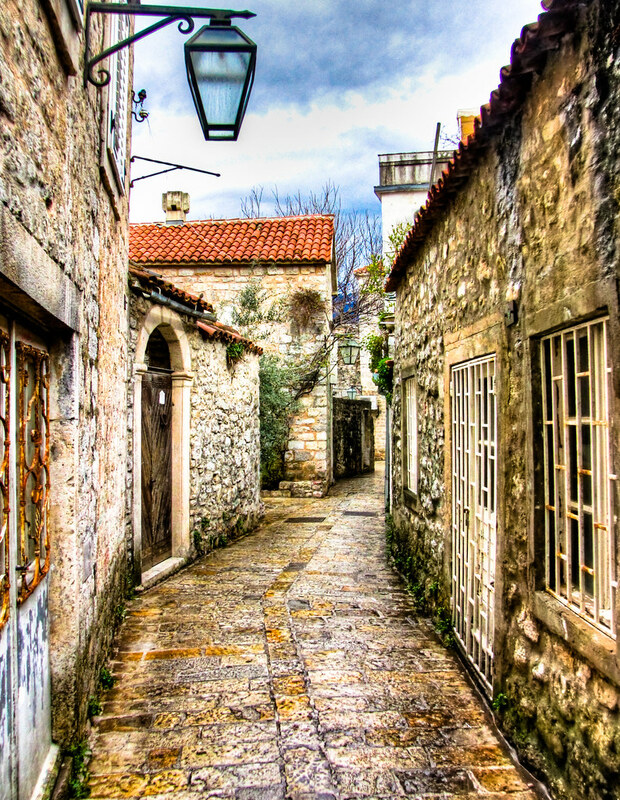 Montenegro, proud of its cultural heritage, has plenty of local radio stations blaring out local hit after local hit. And they all sound like Eurovision contenders! The reason the region does so well is simply that they have internalized creation of the style that makes a Eurovision hit. Also in culture, the national dance is the Oro, a circle dance, where participants take turns on the center of the circle, performing a stylized eagle dance. Eagle dance, you say? Indeed, how did this echo of Mongolia end up on this end of the Eurasian continent?